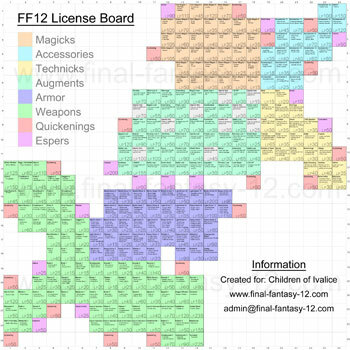 In Final Fantasy XII you are being introduced to the License Board. The License Board is the same for each character. For each weapon or armor you equip, magic or technick you want to use you need to have the License. You can activate Licenses with License Points (LP). You get LP when you defeat monsters. However you can only obtain Licenses adjacent to the ones you already have. You also need to buy Magick, Technick before you can use it. There are six major categories for Licenses: Magick, Technick, Augment, Accessory, Weapon and Armour. Also Quickenings and Espers (if defeated) can be learned at the License Board. Magick: Learn White, Black, Green, Time and Arcane Magick. Technick: Learn Technicks like Libra, 1000 Needles and Telekinesis. Augment: Improve stats like HP and iten effeciency. These are activated immediately. Accessory: Equip armlets, boots and rings. Weapon: Equip swords, bows, guns etc. Armour: Equip shields, light and heavy armour. To view the full License Board, click on the thumbnail below. With thanks to our old affiliate Children of Ivalice for providing this image.